So, I am ready to head home. I have accomplished my task of delivering Scott and Karen safe and secure to Portland, OR and carried a few boxes here and there, and am past the point of missing my family very badly. As I was playing Wii this morning, I realized that I hadn't played Wii with Michael for awhile. It was something we did together for a while, and we have slipped from that time. I have missed the couch(wrestling) time with my kids. I miss holding my wifes hand. What I am trying to say, I can't wait to get home. The trip has been awesome, and I will probably never experience the trip that I just took ever again, and I loved it. But I am feeling very purposeless, and am ready for it to be done. Here is the link for pictures so far. Laney Elizabeth Biddle. This pic was sent while I was on the road. I had a chance to stop in and see Grandma Weinbrenner on my way through Iowa yesterday. It was a good 20 minutes or so. 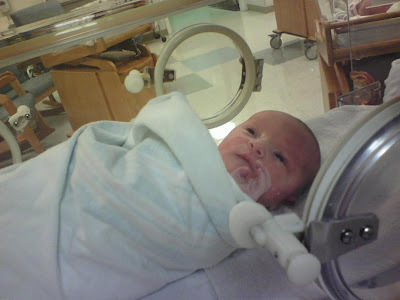 Dusty sent a picture of Laney Elizabeth just as I was telling her she had another Great Grand Daughter. This is a map of our trip through tonight. Well, I am on the road now. I am on a cross country road trip, helping to drive some friends of mine as they move from Columbus, OH out to Portland Oregon. It has been a good day. 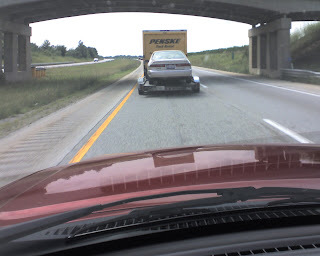 We started out by loading up the truck and cars, and were on the road around 1:00 or so. It was a rough lead up to leaving because there were a lot of things happening at home that was making it hard for me to want to leave. Anyways, the first picture if of us leaving Ohio. 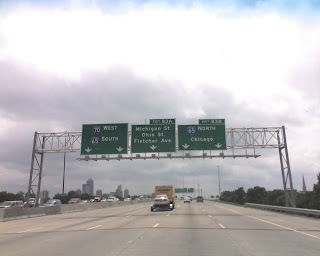 The second is pointing out Michigan St and Ohio St exit in Indianapolis, and the third is what I had to look at all day as I drove the Lowe's vehicle. 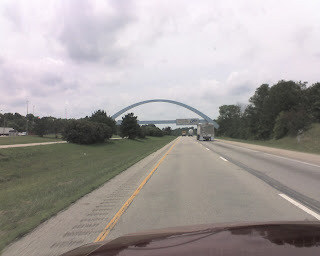 We made it to East Peoria, Ill. and are getting ready for driving 550 miles tomorrow. The rest of my family, who I am missing very much right now, is at some friends house in Cable, OH. Today, as my friend explained to me on the all important facebook, they had a great pillow fight, and have been tickled. Michael told me on the phone that Zoe went potty on their trip to their house. I was going into an underground tunnel to rescue some people from danger. As I was running in, I could see a closed door and yet there was sunlight coming from around the outside of it. I yelled at them to run toward the door and open and run out, but they coward in fear together. They saw the men that were standing there guarding the door and the hallway. I told them to follow me, I helped them to their feet, and ran at the guards myself. I threw myself at them, knocked them down, and opened the door. Some of the people escaped, while others stayed inside for fear of what would happen if they tried. As I was through the door, I was tackled by 3-4 of the guards. They were not able to really harm me, like broken bones or kill me, but they were doing something to the effect of pinching me with their whole hand. The thing was, I knew that it wasn’t life threatening, and yet it did hurt. One of the escaped prisoners came to help for a moment, but then rest just ran off with the rest of them. I was left to deal with the pain myself, alone. Then I woke up with the sensation of pinching all over me. This was the night that I went to bed feeling as though I had been in a war, spiritually, at camp. What was God saying through this vision that he gave me? As Thursday night came to an end, I felt like I had been through a war. I went back to the room, tired mentally, spiritually, emotionally and physically. It was as if I was all beat up, unable to concentrate or focus anymore, and yet know that the victory flag of God was raised all over camp. I was going into evening chapel that night a little unsure of what was going to happen. scripture that said exactly what God was wanting to say, but was not practiced up or organized as much as I wanted to be. I had ideas of different things I could do, but not a final plan. It is nerve racking for me to go in not knowing what is going to happen, what to say exactly, have my stories lined up, and points set out, but as it has happened in the past, God shows up. Not because I am unprepared, but going in God ordained. It doesn’t make it any easier before, or during speaking, but when I know it is God, I just have to go with it. I started and knew that I was going in the right direction, and yet felt like I was struggling with coming up with the next thought and where I was going. I wasn’t sure if the teens were tracking where I was at or going. I was tired, felt like I was failing, and yet I kept going. As I finished I played a video of the first Passion ONE Day of the song “Wonderful Cross”. I went to the back, and thought, “that was horrible”. I was feeling empty, like I tried to give everything, but nothing came out. It wasn’t in a neat little package. I invited them to come to the front and kneel at the cross that was painted on the front wall. And it wasn’t happening. Nothing was happening, except a video being shown. Then, 4 girls got up and went forward. 2 counselors joined them to pray. I asked the assistant director of camp if he would mind going up and playing his guitar while whatever was happening happened. The video ended. Justin sat up front with his guitar and sang, unplugged. I sat back and just watched. Another counselor got up and went up front and sat by himself and began to worship, and a few from his cabin followed. Another counselor went forward, and a few from his cabin went up. They were sitting there just worshipping God in their own way. I had a chance to pray with a young lady that evening. There was a visual right in front of me as I entered the room, of spiritual warfare. One student praying for another. One going to bat and leading the other. The other not knowing what or how to accommodate what was being spoken, just reeling from past experience, and self doubt. The kids had fallen asleep while I was speaking, which was the first time all week, luckily, because I had a chance to ask Tauni to come in and pray as well. She was in her element that night, and it was able to also bring a strength to me. God brought a peace that night to this young lady, and brought an end to the pain that she was feeling in a different way then how she was masking it before. She is not yet a follower of the King of Kings, and though the peace that she felt might be short, she still got a glimpse of the light, and I will continue to pray for her. I know that there was victory, maybe not in the way that sometimes we think of, but we need to learn that we cannot make someone else think or do as we want, they make their own calls, we can only point out the truth in love, and yet sometimes very pointedly. We have to let God sort those times out for us. I rejoined the worshipping, as it had continued the entire time I was away. It ended within a few minutes of coming back. As I look back, it was as if they were using worship as a guard for what God was doing somewhere else, without even knowing it. I sent them talk over and share what God did or was doing in them that night and for the week. That evening, as I saw the young lady I prayed with earlier, there was a new fire in her eyes, a lightness that I hadn’t seen all week. It was a relief, and yet I know that the fight is not over. The peace will only last for a certain amount of time, until she receives the Power of God to withstand the darkness. As I talked with a few people and told them how bad I felt about the message I gave, because I still didn’t feel good about it, I was reminded by 2 campers as they walked by and said, “good talk Scott”, that it is not that I feel good about it, but that God uses it, and those around me that he chose for me to minister with. And as I went to sleep that night, I knew that “I fought the good fight, I finished the race, I kept the faith” (2 Tim. 4:7) of Challenge Camp ‘09, Boot Camp style. Yesterday was a very quiet day. I mostly sat around, layed around and surfed the net from late morning till dinner, of course eating lunch in there somewhere. Very relaxing, which is not always the case. Last night I spoke to the teens about a radical obedience. The fact of needing to follow God exactly the way that He has called us to. We are always able to come up with millions of reasons why we shouldn't, but we it is God, and He has our best interest in mind. I had them close their eyes, and think about a situation or group that they know God has been asking them to be obedient to, and if they had some that they needed a push, or that they know they need to be obedient, to simply open their eyes and look at me. Just about all looked up at me. I then felt that I was suppose to give them a chance to come up front, and have the camp staff and counselors pray for them. Some of the staff came forward, and not one teen came up. I decided not to be discouraged because it was God who asked me to offer, and I did what I was suppose to do. I asked the counselors to reach out their hands toward the campers, and I prayed. As I sent the campers and counselors off to cabin time to discuss what God was speaking and doing in their lives, I stayed in the room and just sat in the front row. I was still reeling from speaking, which is a good thing, and knowing that there was something wrong, just began to pray for understanding. There has been a good connection with the teens all week, and God has been moving, so the lack of coming up front was particularly disturbing to me. It is not something I do all the time, just when I feel I am suppose to offer. I looked to the back of the room and saw the 3 directors still sitting in the same spot, and praying. It began to feel like there was a lid on top of the campers, and it wasn't lifting off. Like one more layer to get through. He continued to show me that we are dealing with a number of campers that have grown up in the church, and are more than likely leaders in their youth group, and that they have more than likely created this facade of themselves and they are not able to break that. They have been duped into believing, just as I was a teenager, and even into my adult life, that I had to look like I had it all together all the time to be a leader. I was looked up to and put on a pedastel by my peers, and I had to live up to it. In came a friend of mine, that had been on staff for a number of years at Camp Gideon, busting the door open. It was more like just opening a door, but in the midst of what God was doing, it seemed more like busting. He came in and said a few things to the directors quietly and made his way towards me. I was still under the influence of what God was doing, and yet went ahead and asked him how he was doing. I was listening the best that I could, and yet still looking to the directors to see where they were at, and believing in my heart that this was a distraction from what God was doing. Nothing sinister or wrong on his part, just timing wise, God was doing something and he came in. Next, another person "burst" through the door, someone that is on staff for the summer, but was not working this week, and came to the camp for the first time last night. I knew that the two could not be a coincidence. I looked at my friend and apologized to him and asked if he would join us in some prayer. I brought him back to the directors along with the other person and asked if they would all pray with me. I explained what God was doing and where I believed he was going, and we prayed. It was a great prayer time. Through this, I was able to see what I am suppose to talk about tonight. Having such a short notice and prep time, I was not prepared for tonight, but God revealed it in His time. Once we finished praying, I apologized again to my friend for interupting our conversation, but I could not fully concentrate on him until God was finished doing what He was doing. The camp director later told me that she knew God was doing something and that she knew we had some distractions trying to get us off track. This leading and understanding is not something that happens real often, but when it does, I pray that I can continue to realize it and not have an ADD moment and tune it out. I am pumped to see what God has in store for this night, and how He is going to work. It has been a good start to "Boot Camp". My family and I arrived this past Sunday evening after an awesome service at church on Sunday, with a combo service of our three congregations put together. We arrived around 5:00, ate dinner with the staff, and registration for the campers was at 6:00. I had a short intro to the week Sunday night and then the fam and I went swimming with the students Sunday night, while it was dark. Monday morning, devos in the morning and sent them to spend some time with God. Played ultimate frisbee late morning, lunch and then swam in the afternoon. In the evening I spoke on the point, which is where God has been pointing me to ever since I knew I was speaking, of being created not as an individual, but as a unit. In boot camp for the armed forces, they come in and are given clothes that look the same, same hair cut, live together, eat together, where one messes up, they all pay. They are in essence, one. Like it or not, there is no such thing as individuals, which is kinda ironic since that is the way life is described in the rest of America. We are all out to get ours, not worrying about other people around us. As I finished, I was not sure if I was finished with the topic yet or not, and am still not sure. We will see what the rest of the week holds. Tuesday morning, devos and quiet time. Tauni, Michael, Zoe and I went to visit with the Kings for the afternoon. We hit a closed road on the way there, and had to make up the trip as we went with no map, but I love that kind of thing. Of course, we were thinking that spending some money on a GPS wouldn't be such a bad thing since we travel so much. The Kings treated us like kings, and we appreciate their friendship. We are hoping they will come visit us here at the camp another time this week. On our way home, both kids were so tired that they fell asleep, before we even made it out of Alliance. We got back to eat some Pizza, and then speak again. Last night I spoke on Radical Trust. Do we really trust God with our lives? Will we entrust our lives to God's church family? Will we serve God by serving others around us? And the participation factor is so huge in those. As I walked away that evening, I felt empored and on fire from God. It was great. Tauni, the kids and I took a stroll over to the Snack Shack for, you guessed it, and then went to do some star gazing. It was pretty cool. Late night for the kids. This morning, breakfast, devos, quiet time and then the kids went back to the room to watch a movie while I did some internet stuff. Lunch, then nap time, because of last night being so late. We are now back to now, and looking forward to what else God has in store.